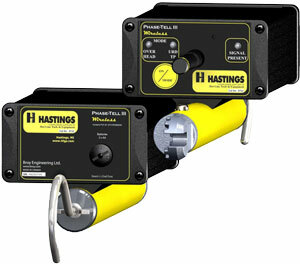 The Phase-Tell 111 is a battery powered, two-piece wireless phasing tool. Used to determine phase relationships on three phase power systems, overhead and URD applications. When contact is made with line voltage or elbow test points, the Phase-Tell 111 units compare transmitted data and then display the results via Red or Green LED lights and differentiated audible signals. Flashing Green lights indicate In-Phase. Flashing Red lights indicate Out-of-Phase. Wireless units communicate up to three hundred feet apart. Both units are identical, no need to identify transmitter or receiver. Voltage range from URD test points to 500KV. Both units conﬁrm the same phase readings. Each unit operates on two "AA" batteries, included. Automatic test cycle when placed in the "On" position. Includes carrying case and instructions. URD bushing adapters and case available. © 2013 Broy Engineering Ltd.